Well, temperature being on the rise, the summer heat will tempt you to grab whatever the cold liquid might be handy. Many of today's most popular choices like sports drinks and energy drinks are loaded with calories and caffeine, which actually increase the body's need for more water and thereby add to your calories and weight. 1. Water is the best option to quench thirst - With high humidity levels, it is necessary to hydrate and drink enough water, even when you are not thirsty. 2. Restrict on caffeinated, carbonated beverages and alcoholic beverages as they are diuretics that can dehydrate the body quickly. 3. 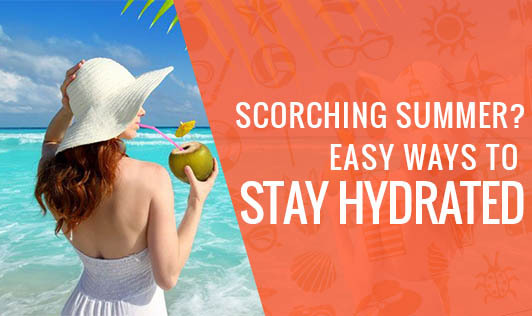 Eat water-based fruits like water melon, muskmelon, and citrus fruits like orange, sweet lime, lemon etc as they are cooling and perfect for hot summer days. They are also rich in minerals. 4. Munch on cucumbers, tomatoes etc as they are high in water content that will help to keep the body's temperature at optimum level. 5. Drink fresh juices without sugar preferably and thin buttermilk, to replenish the fluids that are lost in sweat and outdoor activities. 6. Enjoy the miracle of coconut water. It can rehydrate and replace the lost electrolytes due to various activities, diarrhea and vomiting. 7. If you're having a hard time to drink plain water, spice it up with some herbs/natural flavorings. Give the water a twist by drop in slices of lime, mint cucumber or strawberries. 8. Sip throughout the day - Keep a bottle within easy reach while you are relaxing in front of the television or working on the computer.